Do you know people who make organization look effortless? Do you want to just mess up their desks? Kidding. Sort of. 😉 You can make being organized look easy, too! With just a few simple habits you can be more organized, improve your time management, and get things DONE. Don’t miss these 5 habits of organized people you can adopt today! Very few of us are “born organized.” And even if organizing came naturally to us in the past, the likelihood is that life (aka marriage, kids, home management, day jobs, pets) got in the way and blew us significantly off the organized course. But there are a few simple habits you can cultivate that will help you to be more organized. Let’s jump in to the 5 habits of organized people you can adopt today! Before we jump into the habits, let’s talk a little about why organization matters. Because you may be wondering why you should bother re-creating these habits of organized people…. Will it really be worth your time? You have so little energy anyway. Shouldn’t you put that into building your business? Or your family? Or, hello, naps?! I understand the urge to dump the habits and organizing projects for an afternoon snooze (#beenthere #donethat), but there are some big benefits to investing in organization and building organization supporting habits. Here are a just a few reasons why organization matters. The many benefits of organization could fill an entire post or two, but these are the biggies and hopefully they’re enough to convince you that investing time and energy in organizing will pay off. 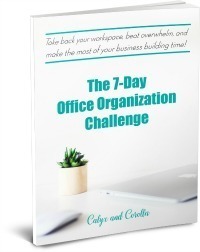 Now that you’re on board the organization train, let’s continue our journey and talk about the 5 habits of organized people you can adopt today! One habit of organized people is that of keeping lists. Writing down what needs to be done, upcoming appointments and meetings, ideas you want to remember, and future tasks frees up valuable physical and mental energy. It also saves you time that can be invested into your business, your family, and your passion projects. I don’t know about you, but the first one is enough to make me want to keep lists! I recommend starting with a brain dump to get all of those things sloshing around in your brain onto paper. Be sure to choose a notebook, digital document, or binder that will be dedicated to keeping your lists. Always keep your lists in one place, so you can quickly and easily find them. Start a timer for 10-20 minutes and just write. It doesn’t matter whether the things you write are giant projects, piddly tasks, or items that seem completely unrelated, just write until the timer goes off. Get those things down on paper and clear some space in your brain! Once your time goes off, set the list aside for a bit. If you think of other items, add them to the list. After you’ve had a break, go back to your list and categorize the tasks on it. Once I’ve denoted tasks based on these categories, I will create a plan of attack ensuring that I spend time each day or each week completing tasks with deadlines, making progress on big projects, knocking out tasks that are weighing on me, and setting aside time for important tasks and things I want to do. There are millions of unique ways to begin keeping lists, and this is just what works for me. You can use this as a starting point then tweak it, or you can develop your own system. The important thing here is to start keeping a list (or lists, if that feels right for you), so that you aren’t trying to remember everything. Free up space in your mind and energy to devote to people, projects and goals! Learn more about the brain dump technique and how to incorporate it into your regular routines in this post: 6 Things To Do on Sunday for the Best Work Week Ever! This habit ties into the one above, and it is where you’ll really start to feel some energy being freed up! Aaaaaaaaand cue the corner huddling, hysterical crying, and “Why me?” blubbering. Yeah, I’ve #been there and #donethat, too. This is no way to go through life, my friends. Thankfully, building your planning ahead skills will help you avoid a whole lot of this mess! Part of planning ahead is being current. You can’t plan ahead if you’re behind! So, consider kicking off your planning ahead habit by getting current. And check in with your brain dump. It will help you with not only getting current but with the next step. Once you’re current, you can start really planning ahead. This is an area that deserves its own blog post (or twenty), but I suggest starting with a calendar or planner routine. Check out this post for a step-by-step process and tips: Add Hours to Your Day with One Simple Tool. Another habit of organized people that you can start cultivating in your own life is building routines. Just as keeping lists frees up mind power and energy, so does building routines. But with one very important addition: building routines cuts down on decision making and decision fatigue. No longer will you sit down at your desk and wonder what you should do at this time on Monday. You’ll have an established routine that helps you know what to do. As with keeping lists, there are as many different approaches to building routines as there are people in the world. And routines are rarely static. I’m a big proponent of routines, but I’m always shifting things slightly to see what will work best for me. A good place to start when building your routines is to go back to the brain dump that you completed earlier and look at your recurring tasks. 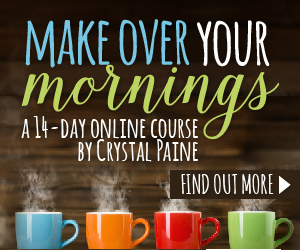 Can you cultivate a morning routine that will get your day started in the right way and help you complete daily morning tasks in the process? Are there tasks that you repeat daily that could be completed in a block each day at a similar time? What about recurring weekly tasks that could be scheduled and completed together? Can you build a routine that includes fun or nurturing activities you love that will add energy and excitement to your days? Spend a little time thinking about the questions above then choose one routine to start building, slowly and little by little. Whatever routine you opt for, start slowly so you can sustain the changes. Organized people are always improving their habits and routines through tweaking. This ensures that they’re as effective as possible, avoiding extraneous steps or actions, and saving time. If you’re just getting started with keeping lists, planning ahead, and building routines, you might not have much tweaking to do. And that’s perfectly okay! Put your focus into the habits above first, then as those habits are establish, you can start tweaking. If you have one or a few of the habits above already established, think about what’s working and what’s not. Then experiment with changes that address the components that aren’t working. The final habit in today’s post is a little different, but it’s incredibly important! Organized people build regular time into their schedules for down time or fun time. And we need to do the same. Take a look back at your brain dump, paying special attention to any items that you put in the “Things I WANT To Do” category. Then build some time into your schedule to do those things. This time might feel like fluff, but it’s not. This time is non-negotiable. Find something you want to do and make it happen. Even if only for 30 minutes. After cultivating the habits we talked about today, you’ll no longer feel the need to mess up the desks of those peeps who make organization look effortless. You’ll be one of them! By implementing and building these 5 habits you’ll be more organized, improve your time management, and get things DONE. You’ll also free up valuable brain space and energy that you can use to cultivate important goals, make progress on passion projects, and spend time with the people most important to you!